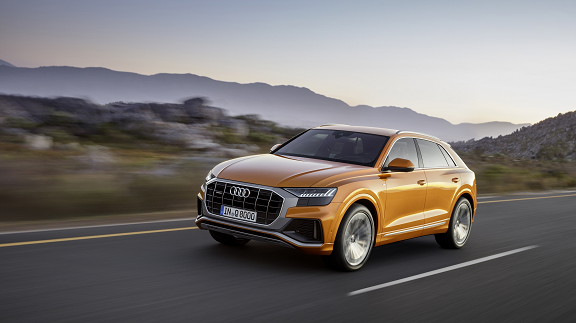 Combining the elegance of a coupe with the functionality of an SUV, the all-new 2019 Audi Q8 offers advanced connectivity, infotainment and driver assistance systems, combined with capable driving dynamics, to set a new standard as the top SUV model from Audi. Wider and lower than the Audi Q7, the Q8 offers a spacious interior with standard seating for up to five passengers and generous cargo capacity. Richly equipped, with comprehensive connectivity, and versatile enough for exploring just about any road, the new 2019 Q8 integrates technology and advanced driver assistance systems, to deliver everything customers expect from a luxury performance SUV. The Audi Q8 features a new 3.0-liter TFSI V6 engine, which generates 335 horsepower and 369 lb-ft of torque. Paired with an eight-speed tiptronic transmission, which is well suited for the low-end torque of the turbocharged V6, its eight gears provide quick, smooth shifts. The 2019 Q8 comes standard equipped with Mild Hybrid Electric Vehicle (MHEV) technology. The 48-volt system is extremely compact — enough to be stored under the rear cargo floor. Every Q8 is equipped with quattro all-wheel drive, offering high-precision and dynamic handling through active torque distribution to both axles. This purely mechanical system transfers torque to the front and rear axles at a standard ratio of 40:60, and when required, can transfer the majority of the power to the axle with better traction. The 2019 Audi Q8 introduces the brand’s new SUV design language for both exterior and interior features. With an octagonal design, the Singleframe grille has evolved to become more muscular and striking. Six vertical chrome struts give the grille an even more dominant appearance. The central element inside the cabin is the all-new MMI touch response display. With its black-panel look, it dissolves into a large, black inlay when switched off, creating a serene interior environment. This entry was posted in Audi_, Car Buying Research Starts Here. Bookmark the permalink.